The standard test bed for cooling tests is the EVGA NVIDIA 680i SLI motherboard. This is primarily based on the consistent test results on this board and the excellent NVIDIA Monitor temperature measurement utility, which is part of the nTune program. 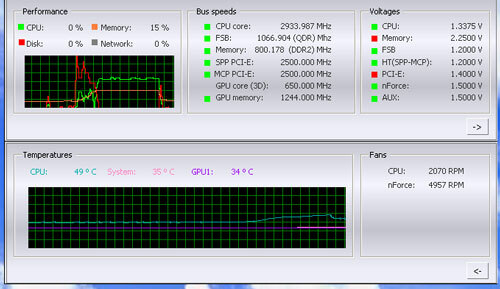 NVIDIA Monitor has a drop-down pane for temperature measurement which reports CPU, System, and GPU results. Reviews at this point will concentrate primarily on CPU temperature. In addition to the real-time temperature measurement, NVIDIA Monitor also has a logging feature which can record temperature to a file in standard increments (we selected every 4 seconds). This allows recording of temperatures during testing and play back, for example, of stress test results that can then be examined when the stress tests are completed. There is also the handy reference of speeds and voltages in the top pane to confirm the test setup. All cooling tests are run with the components mounted in a standard mid-tower case. The idle and stress temperature tests are run with the case closed and standing as it would in most home setups. We do not use auxiliary fans in the test cooling case, except for the north bridge fan attached to the 680i for overclocking. We first tested the stock Intel cooler at standard X6800 speed, measuring the CPU temperature at idle and while the CPU was being stressed. We stressed the CPU by running continuous loops of the Far Cry River demo. The same tests were repeated at the highest stable overclock we could achieve with the stock cooler. Stable in this case meant the ability to handle our Far Cry looping for at least 30 minutes. The same tests were then run on the cooler under test at stock, highest stock cooler OC speed (3.73GHz), and the highest OC that could be achieved in the same setup with the cooler being tested. This allows measurement of the cooling efficiency of the test unit compared to stock and the improvement in overclocking capabilities, if any, from using the test cooler. The Infinity comes standard with one 120mm fan, but it can mount additional fans. We therefore ran all tests at both stock conditions (one fan) and with two fans in a push-pull configuration. In addition to cooling efficiency and overclocking abilities, users shopping for CPU cooling solutions may also be interested in the noise levels of the cooling devices they are considering. Noise levels are measured with the case open on its side and are measured using a C.E.M. DT-8850 Sound Level meter. This meter allows accurate sound level measurements from 35bdB to 130dB with a resolution of 0.1dB and an accuracy of 1.5dB. This is sufficient for our needs in these tests, as measurement starts at the level of a relatively quiet room. Our own test room, with all computers and fans turned off, has a room noise level of 36.4dB. Our procedures for measuring cooling system noise are described on page seven along with noise results comparing the stock Intel cooler and recently tested CPU coolers to the Scythe Infinity coolers.